The Tile Backsplash in Denver—Dated or Classical? If you were to go by Internet or social media opinion lately, it would be hard to escape the notion that certain interior designers think tile in Denver area kitchen backsplashes are becoming dated. At PetraSlate, we contend that tile in Denver kitchens, such as travertine tile backsplashes, are not dated, they are “classical” and are here to stay for a long time. There is a wide gulf of opinion between these two adjectives, so if you are considering a travertine backsplash for your new construction or remodel, don’t be put off by an avant-garde minority of designers whose idea of “modern” is mostly centered upon the industrial kitchen look inspired by television cooking contests. There is a design industry impulse to call certain looks “dated.” Certainly, in the case of avocado green Formica countertops, literally everyone who can see can determine for themselves that a certain look or material has its best days long behind it. Having 27 years in the stone industry, we at Petraslate don’t subscribe to the notion that travertine tiles used in Denver area backsplashes having seen better days. No matter the era, natural stone tiles still perform as well as they ever did, and last for decades with minimal maintenance. 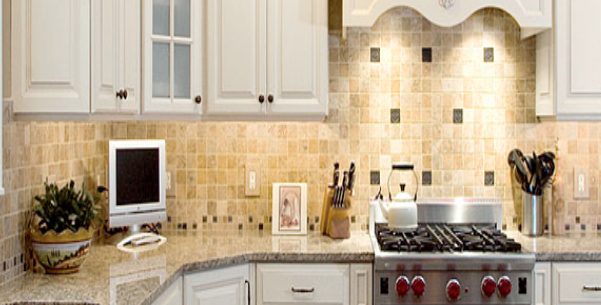 With a tumbled finish, travertine tile backsplashes can look timeless. Arranged cleverly in multiple hues or different sized or oriented tiles, travertine can also bring visual interest beyond the ordinary. There are solid reasons as to why travertine tile backsplashes are not a fad. Tiles have been on the interior decor scene for centuries on end—they have universal appeal. Imagine forward a decade or so, how “dated” are these “modern kitchens,” overdone in stainless steel, going to look when the TV kitchen trend passes at the decree of new and “edgy” designers? When the bleeding edge of kitchen design moves on to ground coconut husk panels, rainbow anodized titanium alloy, or some other extreme new of “freshness,” travertine tile will still be the smart choice for people who might actually want to sell their homes some day. And PetraSlate will still be here, providing Denver’s best selection of natural travertine tiles, ones of a quality and variety of hues and finishes that cannot be matched, let alone beaten, by any number of big box or chain store sources of tile in Denver. For samples of travertine tile, or for more information on using travertine tiles in Denver as a kitchen backsplash, contact PetraSlate today.